Here is a soap with the clean smell of lemon and flowers! We have incorporated our annatto seed infusion, for a beautifully natural yellow color. It's like walking through a lemon orchard! You may want to pair this soap with our Lemon Verbena Emollient Lotion. They go hand in hand in carrying this fragrance! 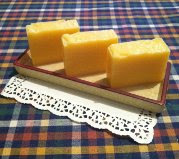 Our Lemon Verbena Soap is 4.5 Ounces in weight and priced at $8.00 each. Ingredients: Water, Saponified Coconut Oil, Palm Oil, Sunflower Oil, Olive Oil, Shea Butter, Floral Fragrance Oils, Lemongrass Essential Oil, Titanium Dioxide, Yellow Colorant.